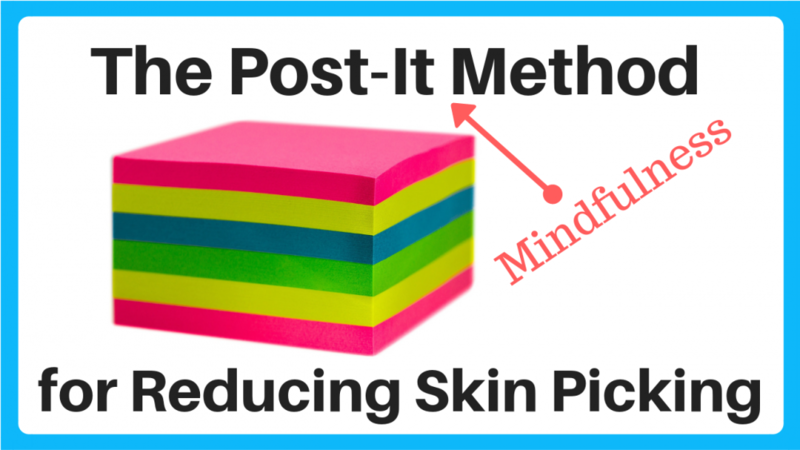 Some of my coaching clients have been finding this”post-it method” of mindfulness helpful in their work to become free from skin picking and similar behaviors. So great work Irina, let’s dive in. What is she doing here? What’s this mindfulness method? So mindful check in, we start with just a check in or this is what she starts with. This part is very similar to what I was teaching the group, so just closing your eyes, paying attention basically just to what’s going on in your body. So first of all, closing your eyes and noticing the physical. So what’s bringing your attention or what’s getting your attention physically. So besides, I mean it’s nice to bring your attention to certain things physically, like the chair below you that you’re sitting on the floor. The points of contact that your body’s making also to your breath. These things are calming you down, but you also can notice some other things that are standing out in your physical state. For example, maybe you’re hungry or thirsty, maybe you’re tired. So these are some things physically, then emotionally, what are you noticing emotionally and Irina would write these down on Post-its, right? So she had the physical. Now she has been emotional. Maybe she’s sad, very likely she’s overwhelmed. Then you could notice thoughts. What are you thinking about? And write them on the Post-it too of thoughts. So Irina was thinking along with the overwhelming feeling. It was because she was thinking, I have so much to do, how can I get this done? And then Irina probably because she’s a working mother. She had a lot of guilty thoughts, so she had a whole separate Post-it for guilty thoughts. For example, I left my crying son with the babysitter so she would do the check-in and then write down her Post-its, which really helps to just kind of get it out of you. These things that are banging around in your head, and you’re not fully conscious of even because you’re trying to focus on your work, so you give it your full attention for a couple of minutes, you notice you write these things down. And then what Irina does is she turns the Post-it’s over and writes down what could she do about each of these things. So first she looks at the physical, she’s hungry, sorry, she’s hungry and stiff in this example and so maybe she turns over and writes and gets something to eat, get up and stretch, and of course you can combine those. That emotional, she’s overwhelmed. “Take a few deep breaths.” She says to herself, okay, maybe if she’s sad, she says, “I’ll, call a friend or go talk to somebody.” The thoughts, “I have too much to do. I won’t manage to get everything done.” She thinks to herself and the right sound, make a list that will help and then prioritize that list in some way without reordering it or circling the most important thing and just getting that done first and then coming back to it. And then of course with the guilty feelings, what she does with guilty feelings is thinks of reasons that she doesn’t have to feel guilty about this. Why she shouldn’t feel guilty. So these are my for example, because I don’t remember what they are and I don’t have kids, so this is like just my own imaginings. What you could write, I have to work, babies cry. Yeah, that’s what they do. I’m very attentive when I’m there with him and guilt doesn’t help anyone. So those are just examples. So then she has all four of these Post-its basically is like, okay, she’s got a game plan for what happens next. And that’s really helpful and it just reduces her stress, connects her with herself, and she’s able to do what she needs to do instead of avoiding with skin picking, which we often do, is just like, oh, I’m going to go think about this instead out of anxiety, I just get to do this behavior and not fully deal with it. 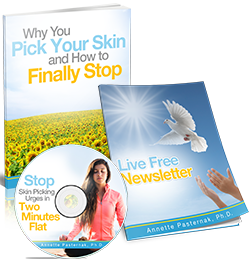 In this method, you really jump in, you really shine a spotlight inside your body and brain and see what’s going on and see what you can do about it. So it’s been very helpful for every Irina and also helpful for some people that she shared with this, shared this with and that I’ve shared this one, so maybe it will be helpful for you. Please let us know what part you found most helpful. Write a comment, give Irina and me if you want a thumbs up and if you’d like to join a group. I have a group starting in October and I periodically, every few months have a group starting, so I’ll put the link to that in the YouTube description below. 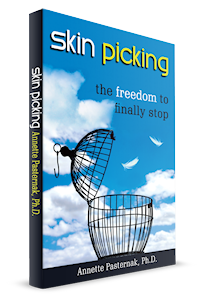 Because this is really a wonderful way to get so much freedom from your picking and really recover in a way and to a degree most people joining the group, they are actually surprised they surpass what they ever thought they could do and how well and how much less picking that they could do they never thought was possible. So I’d love to see you in my next group. So check it out and please come back and let us know if you try this method and how you like it. See you next week.